After a few months of wild swings in mid 2018, in February US consumer credit continued to normalize, rising by $15.2 billion, slightly below the $17 billion expected, following January's $17.7 billion increase. 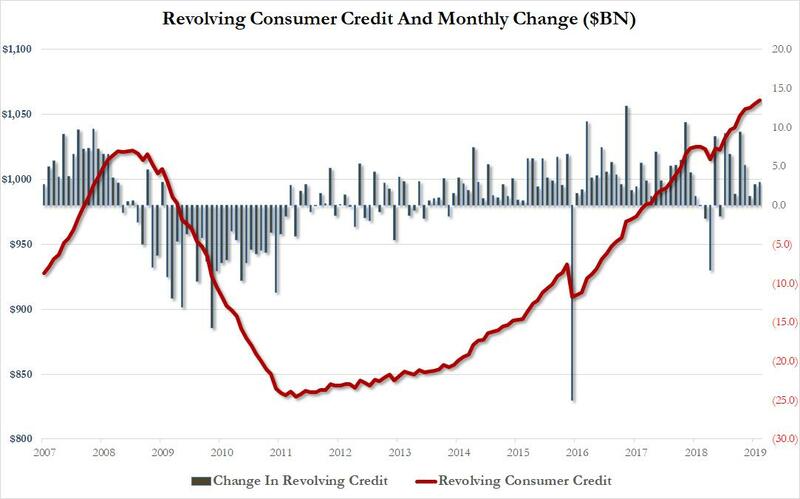 The continued increase in borrowings saw total credit storm above $4 trillion, and hit a new all time high of $4.045 trillion on the back of a America's ongoing love affair with auto and student loans, and of course credit cards. 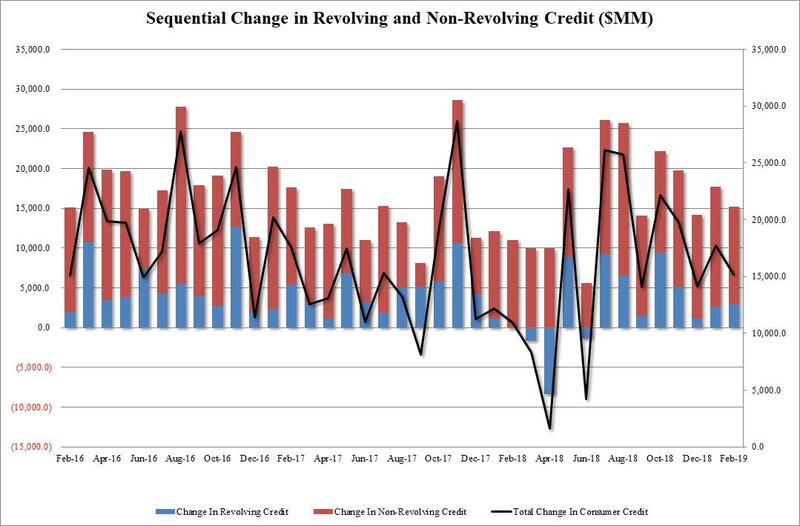 That said, as shown in the chart below, there has been a decisive slowdown in total monthly consumer credit creation, which has shrunk notably from $26 billion last July to just over $15 billion in February. 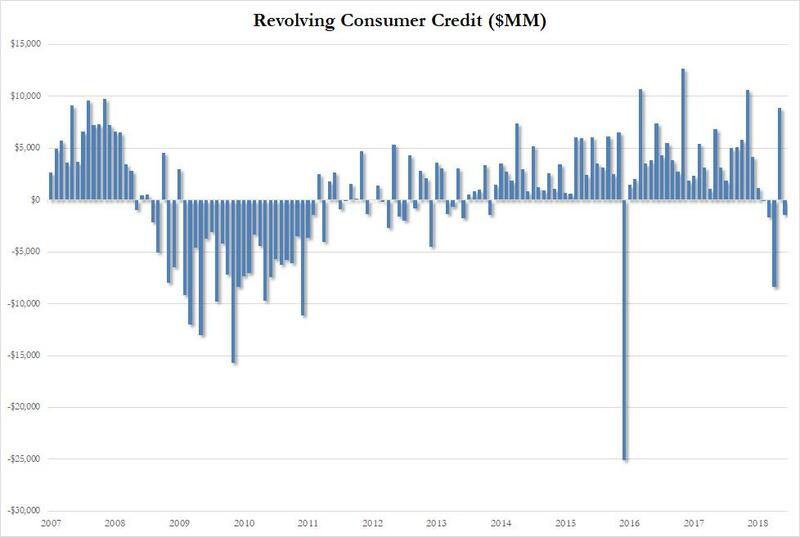 Revolving credit increased by $3.0 billion, an increase from January's $2.6 billion, rising to $1.061 trillion, a new all time high in total credit card debt outstanding. There was a small decline in the monthly increase in non-revolving credit, i.e. 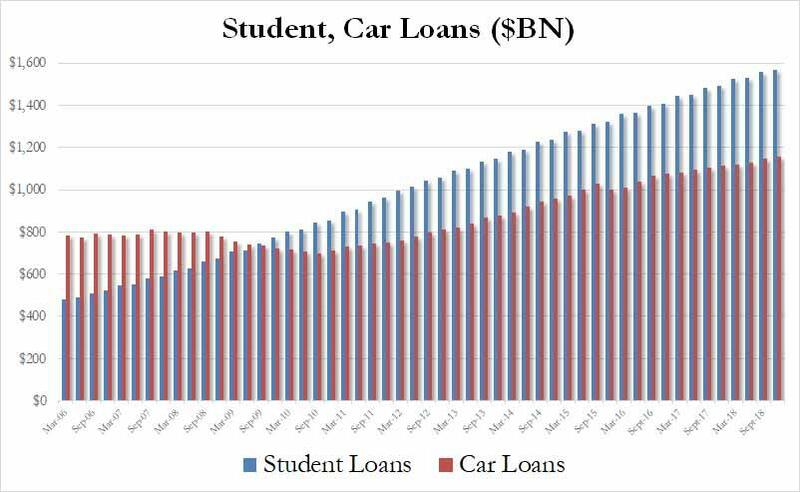 student and auto loans, which jumped by $12.2 billion, down from the $15.1 billion increase in January, and bringing the nonrevolving total also to a new all time high of $2.984 trillion. And while February's continued rebound in credit card use may assuage some concerns about the sharp slowdown in spending in the end of 2018 and start of 2019, and the subsequent plunge in retail sales, as the household savings rate surged by the most in years, one place where there were no surprises, was in the total amount of student and auto loans: here as expected, both numbers hit fresh all time highs, with a record $1.569 trillion in student loans outstanding, an impressive increase of $10.3 billion in the quarter, while auto debt also hit a new all time high of $1.154 trillion, an increase of $8.4 billion in the quarter.